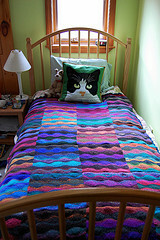 It is Day 2 of Knit/Crochet Blog Week. Don’t forget that all this week we have a small giveaway in operation – leave a comment on this post to be in with a chance. Blog about a pattern or project which you aspire to. Whether it happens to be because the skills needed are ones which you have not yet acquired, or just because it seems like a huge undertaking of time and dedication, most people feel they still have something to aspire to in their craft. If you donâ€™t feel like you have any left of the mountain of learning yet to climb, say so! “Blog about a pattern or project which you aspire to.” There are so many! How am I supposed to choose one to write about? Key patterns here would be the Queen Susan, the Orenberg Medallion Square, and maybe one or two of Sharon Miller’s patterns.Â The really great thing about lace knitting, serious lace knitting, is that it is cheap — a very small expenditure on yarn could keep me knitting for months on end.Â That thought, in conjunction with yesterday’s writing, made me think very hard about the fact that my knitting has always been driven by a sense of economy. There are a couple of blanket patterns that I very much want to knit but I cannot imagine that I will ever have sufficient funds to buy the necessary yarn.Â It would be difficult to put into words just how much I want to knit a Lizard Ridge in a beautiful yarn such as Noro Silk Garden.Â I do not need that blanket, and no doubt the knitting of it would be really quite boring, but it is the colour — that sheer swathe of brilliant colour… but oh, my, the cost! Another blanket that will probably never see the light of day would be a planned and colour designed version of An African Adventure.Â I do hope to rustle up a scrap yarn version though. Last night while I was waiting to sleep, I got to thinking about yesterday’s post and the fact that I reckon I could recall everything that I have ever knitted and picture it in my mind.Â I traced my knitting history through the small hours, remembering this sweater, and that, what I wore them with, which yarn I used, the particular colour.Â The yarn and its colour was often driven by price, and available funds — so I had a succession of strangely brown garments ((the yarn purchased as lot ends in sales and always the colours that nobody else wanted!)) … one of which sat in front of my eyes in the dark and stubbornly refused to go away again. I really loved that sweater, despite the fact that it was chocolate brown!Â I think I knitted it around the mid-70s, but I do believe that I could recreate it now.Â The pattern is long lost, but the image remains so strong that I think with my newly honed skills, I could conjure it up again.Â The funny thing is that it would probably be brown again — because I would use handspun from fleece. It was a fairly skinny fit , with a deeply ribbed waist that came up into a V shape towards the cleavage line.Â The sleeves were close-fitting with a deep ribbed cuff.Â The remainder was in reverse stocking stitch, with a simple picot edge complimenting the round neck and three button plaquet front opening. There it is then, my aspiration, my mountain to climb — a plumbum original design.Â Okay, not exactly my design but the conversion from vision to stitch count would be all my own hard work.